The Rocky films have so gradually departed from anything resembling reality that it's hard to remember now how genuine Rocky's initial struggle felt back in 1976. Whether it was Rocky squaring off against Clubber Lang in Rocky III or Ivan Drago in Rocky IV or coming out of retirement for one more fight against the ludicrously named Mason "The Line" Dixon in Rocky Balboa, he's become more myth than man. Director and co-writer Ryan Coogler (Fruitvale Station) is acutely aware of this. His Creed is a throwback to the immediacy of the original, and a rousing tribute to the enduring power of the underdog. It's fraught with the weight of history and laced with knowing references to the four decades we've spent getting to know and love the Italian Stallion. 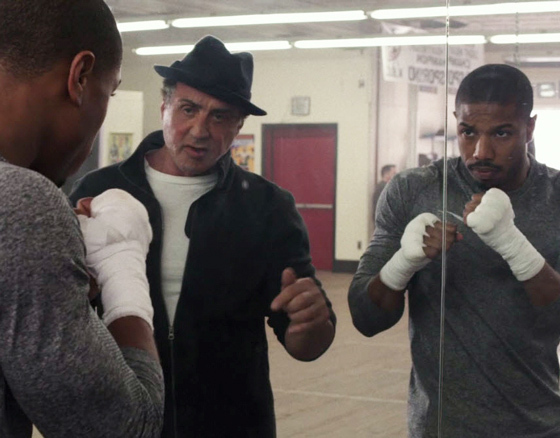 With this sequel that few could have possibly wanted, Coogler improbably injects new life into the franchise while passing the baton to a new worthy contender, delivering the most surprisingly gratifying chapter in the story of Rocky Balboa in the last couple of decades. At the outset, Balboa is nowhere to be seen, and yet his shadow looms large. We're introduced to the young Adonis Johnson (Michael B. Jordan), a scrappy orphan who seems to only be able to express himself with his fists. He's taken in by Mary Anne (Phylicia Rashad), the widow Rocky's adversary-turned-friend Apollo Creed left behind when he was killed in the ring by Drago in Rocky IV, who explains that Adonis is Apollo's illegitimate son. Flash forward to the present and Adonis is working at a bank to please Mary Anne but fighting in Tijuana on weekends because the sweet science is in his blood. When he quits his day job to become a professional fighter, he journeys from the luxury of Mary Anne's mansion in Los Angeles to the hard streets of Philadelphia, where he finds himself walking into the restaurant owned by Balboa asking to be trained. Balboa resists at first, but he too can only deny his nature for so long, and he eventually relents and agrees to see what the kid can do. Before too long, Adonis is being offered an unlikely shot to square off against the light heavyweight champion in a match he is almost certain to lose. Coogler shoots often in jittery hand-held format, adding gritty authenticity to Adonis's struggle to separate himself from the legacy of his father and become his own man. Yes, there's perhaps an overabundance of training montages, but the payoff of the fight scenes make it worth your while. A bout against the highly touted son of a trainer, featuring one long unbroken take that's been expertly choreographed, is absolutely exhilarating and stands alongside, if not above, the best ring action in the history of the storied franchise. Stallone does some of his best acting here in years, capturing the despair and loneliness of a damaged legend who's devoted his life to pugilism while watching most of his loved ones die around him, and he has to be considered a dark horse for supporting actor award consideration. However, this is Jordan's movie, and the young actor delivers a powerhouse performance that makes the younger Creed into a man who's equal parts fortitude and fragility. There's even a tender love story for him with a promising musician (Tessa Thompson) who suffers from degenerative hearing loss that's a worthy successor to Adrian and Rocky's romance. It's hard not to marvel at the overarching achievement in the way that the series has now come full circle. In a case of the apprentice becoming the master, Rocky's finally developed into Mickey, the grizzled trainer that took him under his wing many years ago. Art also imitates life yet again — where Rocky's own underdog story was once mimicked in how Stallone went seemingly overnight from nobody to movie star, this new instalment takes a franchise that appeared to be abandoned just like Adonis and revitalizes it, against all odds, to score an undisputed knock-out.